This shop, which sells gifts, clothing and jewellery, is named after a sailor who survived a disastrous shipwreck off South Africa in 1874. The building is thought to be one of the oldest in the village. Its name, Pen Stryd, means “top of the street”. The houses further up the road were built later. After the Anglicisation of Welsh personal names, many people in Wales shared the same names. They were distinguished by the names of their homes or occupations. Hence Thomas Lewis, who lived here, was known as “Twm Pen Stryd”. He was brought up in Moelfre. His father was blind. During his seafaring career he was quartermaster of a sailing ship called Cospatrick. In September 1874 the ship left England for New Zealand. On board were 429 men, women and children from across the British Isles who were emigrating to New Zealand. There were also four passengers who had bought tickets for the voyage, 44 crew and the captain’s wife and son. 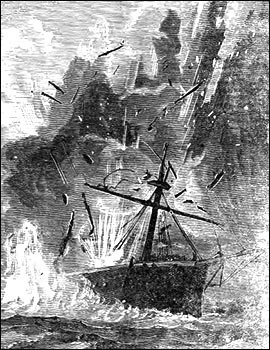 On 18 November, fire broke out when the ship was near the Cape of Good Hope. According to the subsequent inquiry, someone had entered the ship’s fore-hold, carrying a candle, to steal some of its cargo. The candle had set light to tar and other flammable materials stored for the ship’s maintenance. The contemporary picture (right) is an impression of the ship burning. Only two lifeboats were successfully launched as the fire spread quickly. The panicking passengers were said to have interfered in the work of the ship’s crew. Half of the 64 survivors were lost when a storm sank their boat. Exposure to the elements and lack of food and water killed most of the other boat’s occupants. By the seventh day adrift, the last few survivors were forced to eat parts of livers from two corpses. Only five were alive when they were rescued by a passing ship on 27 November, after drifting c.500 miles from the wreck. Their bodies were so frail that they had to be wrapped in blankets before being moved. They were taken to St Helena island, where two soon died. Thomas Lewis, then aged 46, and two of his fellow crew members were the only survivors. They were later tried in a criminal court for cannibalism. Thomas Lewis had earlier survived the wreck of a ship called Linden. He died in 1894 and was buried at Llanallgo. About 470 people died in the Cospatrick disaster. An exact count is impossible because earlier in the voyage some people had died and babies had been born. Eight people from Glamorgan were among the dead: Mr and Mrs Phillip Jones of Quaker’s Yard and their two children; Mr and Mrs Benjamin Reeves of Pontypridd; David Isaac of Penygraig, Rhondda; and David Jones, previously employed at Penygraig colliery.